Don’t like/own circular needles? Are you a real beginner? Knit this fun slouchy beanie flat then seam it up. You can use your favorite circular needles as straight needles for this pattern as well (I find it a bit easier using 24 inch circulars). You aren’t going to decrease, so there is no need for double pointed needles. We will be using the same principles as the Basic Hat in the Round Pattern- swatching for gauge! *At least 80 yards of funky or non-funky handspun. In this example, I used my own handspun of Jacob and Coopworth. Knitting needles (10-14 inch straights or circulars- I picked size 15, 24 inch circulars to use as straights). *Check your gauge and fabric (the quick and dirty way): Cast on 20 stitches, and knit in stockinette stitch (knit a row, purl a row) for about 4-6 rows. Place your fabric down, and measure the number of stitches per 4 inches. In this example, I got 1.75(2) stitches per inch on size 15 needles. I first tried size 13’s, but the fabric was too tight. On size 15’s, it’s just right for me. This is a personal choice, based on how tightly you knit, the yarn you use, and the fabric you like. *Measure your head: Once again, 22 inches. Multiply your head circumference (22 inches) by number of stitches per inch from your swatch (2 stitches/inch)=44 stitches for cast on. If you want to add 1-2 stitches extra (as you will be seaming the sides) , you may do so for a looser fit. You will be working in stockinette stitch (knit a row, purl a row), unless you would like more texture- you can knit every row for garter stitch. Brim: To avoid a roll brim, I knit each row (garter stitch) for 4 rows. You can also do ribbing (knit 2, purl 2) as well. Continue to knit your hat for maximum slouch- about 8-10 inches (this hat=10 inches from brim to top). Leave a long tail (about 12 inches). Thread the yarn through a tapestry needle (large eye yarn needle) and bring the yarn through the stitches on your needle a few times, and tighten. This is the crown of your hat. To seam the sides of your hat: With hat right side out, match your sides up. You will be doing Mattress Stitch to seam your side. Here is a video tutorial if you need: https://www.purlsoho.com/create/mattress-stitch/. Congratulations! 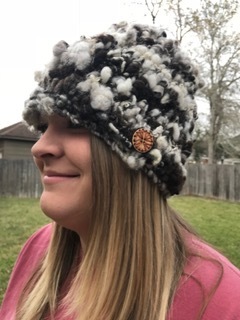 You have a slouchy hat!